Edward Lord (1781–1859) and Maria Lord (née Riseley, 1780–1859), entrepreneurs, show how a convict could rise, and how chancy both business and social success were. They married in Hobart in 1808: Edward was an army officer, Maria a convict who had borne three children, two of them Edward's. They grew wealthy: Maria, a shrewd businesswoman, set up successful trading concerns, and Edward, acting lieutenant-governor in 1810, amassed land grants and often sailed to England to establish business concerns, without much success. They led the colony socially, and Maria bore more children. In 1824 Edward sued Charles Rowcroft for criminal conversation with his wife, won the case, and took the children to England, where he himself inguled in criminal conversation with their governess. 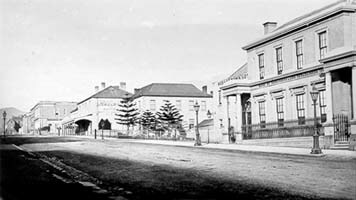 Maria opened a general shop, which became the best in Hobart. Later some of the children and Edward visited, in apparent reconciliation. Further reading: ADB 2; A Alexander, Obliged to submit, Hobart, 1999.